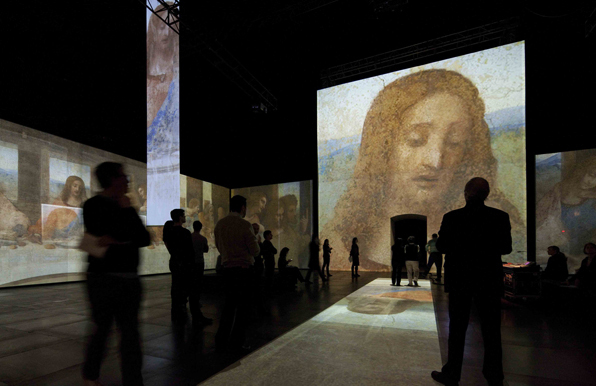 One is surrounded by screens, by music, by images and above all by Italy. And you just want to be there and you are at the Park avenue Amory watching or rather attending a 45-minute multimedia experience directed by English film director Peter Greenaway on Leonardo da Vinci’s The Last Supper. Peter Greenaway in all his interviews claims: Film is dead. Long Live the Film!. A different experience that takes the viewer by the hand through a painting. The hands for example, at some point, are highlighted in the painting creating a beautiful sequence of pointed fingers and raised hands talking to each others created a chain of flesh. Italy is the backdrop of this mystic adventure, the dome of the Refectory of Santa Maria Delle Grazie in Milan, the gardens, the streets. Thank you Pascale, I go! I totally agree with you and was glad to share this wonderful art lesson with you. Fortunately it’s coming to Paris so my friends there will be able to see it. I’ll spread the good news like you do.